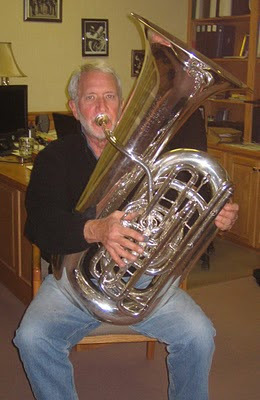 I am just back from the Capitol Tuba Conference and the Texas Music Educators Convention. Some thoughts on testing instruments. 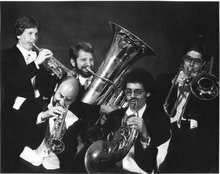 “Kill The Wabbit” is a good test of a tuba. I hear it frequently, played well and sometimes not. First know the excerpt. Know the fingerings on the tuba at hand. Know the rhythm. So first, know the excerpt and then make a statement. Better to play something simple that you play well than to attempt something you don’t know. So, how do you make the sixteenths louder than the dotted eights? Do NOT play the dotted eighths as loud as you can. It’s just that simple. I’ve done a little singing. Doo-Wop etc. I was once asked to sing the bass part in the country song Elvira. Most days I have a low C. Like every other bass I know, low C is not as loud as second space C. It is very tempting when the giddy-up part comes to belt it out. Big mistake. Sing it softer. That way you can sing a solid low C.
Axiom #2 is similar: ‘Crescendo means Start Softer’. Worth repeating: ‘Crescendo means Start Softer.’ Even if you are playing a loud passage, the best way to make an effective crescendo is to drop the volume down a little when you see ‘crescendo’. Yes the J-870 is in production. The mouthpipe angle is just like the sample I had in DC and SanAntonio. Milano Music has 2 and three more on order.